The central web hub of all project information for every stage of the project lifecycle. eShare provides an innovative and easy way to utilize project information and optimize business processes. It allows organizations to combine, find, visualize and share project and asset information in a single and easily accessible web portal. People in different roles can use eShare to access information created with specialized applications for design and other business functions, without having to use each application separately. 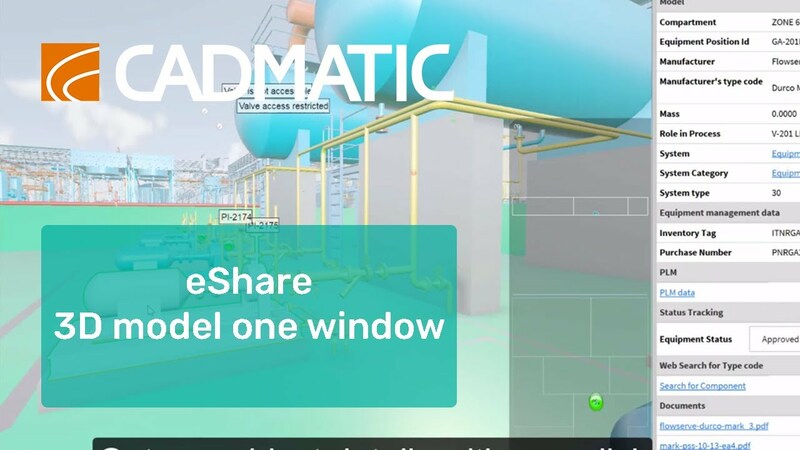 With eShare, the user can take full advantage of the visual power of digital twins and modern asset management practices. Read more about eShare use cases for Owners and Operators. Use a 3D model as one window access to all related project data, including PDM/PLM, procurement and tracking or ERP. 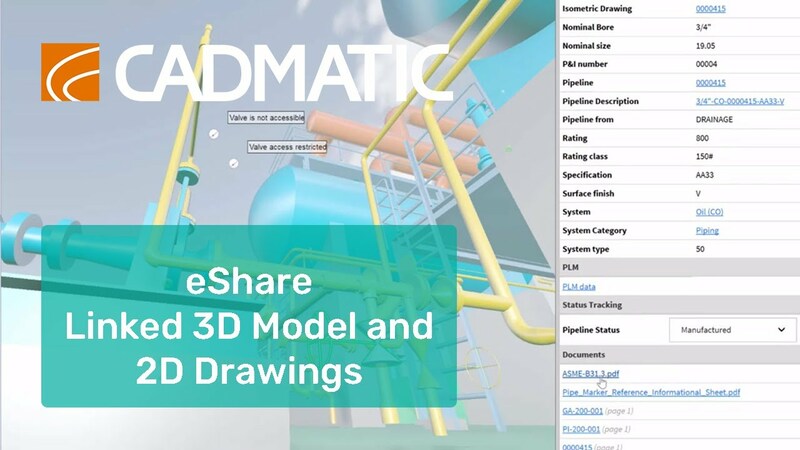 Data can be published to eShare from the CADMATIC design applications, converted from other CAD formats or loaded from external files or databases or linked with other systems. The 3D model is not just an additional instance, but the central connecting hub of the whole project. With one click on a 2D drawing, you can find the item in the 3D model and all other related documents. The 3D model is not just an additional instance, but the central connecting hub of the whole project. Facilitate project change management and control construction phase and planning using the 3D model as a discussion board. Store comments saved on top of 3D model with labels and dimensions, use the possibility to compare it with previous versions or send an email with the attached picture. Follow the certification process from equipment suppliers with visualization of status information. Create test packs and collect all related information. Add more information on top of the 3D model and use all the data for decision facilitation. Smart points in the model can store silent knowledge or even be linked with data from instruments. The extensive search functionality allows the location of any needed information. Any data from eShare can be used for visualization purposes. Once point clouds are added to the eShare server, users can directly navigate to between the point clouds that will be shown in photorealistic views and see point clouds alongside the 3D model. It is possible to measure distances between the cloud and 3D objects, add smart points to store notes or other extra information related to the point cloud. Categorization based on the stress calculation status of lines. eShare store all kind of project documentation: 2D layout drawings, isometrics, P&IDs, sketches, equipment documentation and manuals and much more. Documents containing labels can be used as an interface for the 3D model access and search for items. The linking between 2D and 3D data will be created automatically based on project rules. Additionally, 2D drawing links can be colored according to data: availability in the 3D model, status of installation progress, compatibility of components or flow directions.